Ought not Christ to have suffered? The Bible says: “Then He said unto them, O fools and slow of heart to believe all that the prophets have spoken: Ought not Christ to have suffered these things, and to enter into His glory. And beginning at Moses, and all the prophets, He expounded unto them in all the Scriptures the things concerning Himself. After His resurrection from the dead, Jesus answered the probing questions that were on the minds of His disciples. They were in total confusion and bewilderment when their Lord had been brutally scourged and crucified. They had believed that He was the One who bring deliverance to their people. And when they saw Him alive they were shocked and had more questions. There are three things that almost drive atheists, agnostics and Christ rejecters around the bend. They are as follows, No. 1: Who Moved the Stone? No. 2: Where was the body of Jesus? No. 3: Why did Saul of Tarsus, the murderous Christ hater convert? And here is one more to get everyone’s brain functioning, No. 4: How much money did the Jewish Sanhedrin pay the Roman Soldiers guarding Jesus’ Tomb to Lie? We know they paid JUDAS thirty pieces of silver to betray the Son of God. The Scriptures record that they gave large money to the Roman soldiers who fell like dead men when they saw the angel! We also know that they promised to BRIBE the Roman Governor, if he discovered the truth. The Holy Bible says: “And behold there was a great earthquake: for the angel of the Lord descended from Heaven, and came and rolled back the stone from the door and sat upon it. His countenance was like lightning and His raiment white as snow: and for fear of him the keepers did shake, and became as dead men. “And when they (women) were going, behold some of the watch came into the city, and showed unto the Chief Priests all the things that were done. And when they were assembled with the elders, and had taken counsel, they gave LARGE MONEY unto the soldiers, saying, say ye, His disciples came by night, and stole Him away while we slept. A further question: No. 5: Why did the Jewish Leaders hate Jesus of Nazareth so deeply? Was it because He uncovered their hypocrisy, or more? Was it because Satan was in control of their thoughts, actions and deeds? We know it was because He called Himself the Son of God! The Bible says: “The Jews answered him (Pilate), we have a law, and by our law He ought to die, because He made Himself the Son of God.” (John 19: 7). HE CAME TO EARTH TO SAVE US! He was BORN TO DIE as God’s Paschal Lamb, to save us from our sins! Jesus knew why He was born and that His death would destroy Satan’s dominion over mankind. Sometimes, however, we give the Devil too much credit. He wasn’t that smart when he as a created being, tried to overthrow Almighty God, and was cast out of heaven together with his rebel band. Pride makes people and fallen angels Stupid! CAIAPHAS spoke prophetically by the Spirit of God. He said; “You know nothing at all, nor consider that it is expedient for us, that one man should die for the people that the whole nation perish not. The Jews know NOTHING AT ALL, when they still reject their own Messiah, the Blessed One! The Mohammedans know NOTHING AT ALL, when they DENY Jesus is the Son of God. 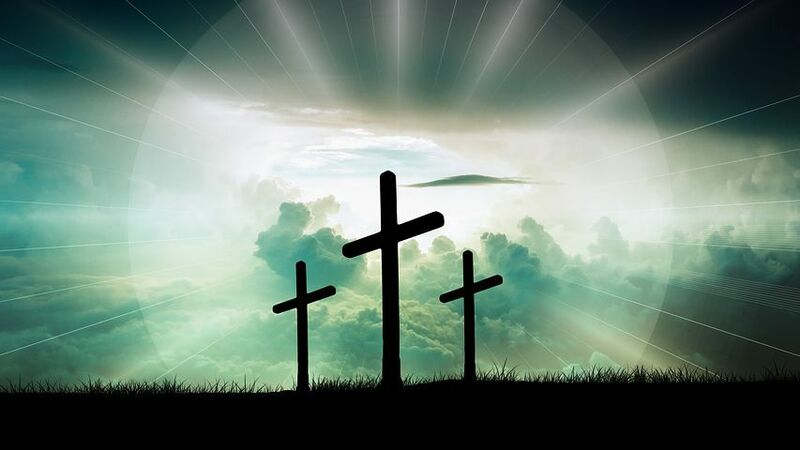 They preach that another man was crucified in the place of JESUS, in spite of the Jewish meticulous recording of that Historic Event and the official records of His crucifixion by the Roman Authorities. Their theology is built upon blatant lies spoken by a man who couldn’t read or write. They know NOTHING AT ALL! THEY KNOW NOTHING AT ALL! Atheists, evolutionists, agnostics and Christ Rejecters know NOTHING AT ALL, when they close their eyes and ears to the truth of God’s Word! The Politicians who hate the Gospel of Christ so much that they change God’s laws of marriage, promote abortion and sexual perversion to please voters during an election, know NOTHING AT ALL! MOSES, the Lawgiver, wrote: “And the Lord God caused a deep sleep to fall upon Adam, and he slept: and He took one of his ribs, and closed up the flesh thereof; and the rib which the Lord God had taken from Man, made He a Woman, and brought her unto the Man. According to the writings of Jewish Rabbis in the Babylonian Talmud from B.C. 1,000, the only time men were given in marriage to men, and women given in marriage to women was during the Days of Noah, just before God sent the Flood upon the earth. My question is, “Should be concerned how Almighty God looks upon Canada and other nations who legally are following in the same footsteps as those in the ‘Days of Noah’? After five thousand years of recorded human history, Canada’s naïve government has unilaterally changed the definition of Man and Woman, male and female, boy and girl. In their state of HUBRIS, they must feel almost godlike, knowing more than Moses and Jesus Christ! Caiaphas was right, such Politicians know NOTHING AT ALL. Jordan Peterson is a Canadian clinical psychologist, cultural critic, and professor of psychology at the University of Toronto. I would suggest that all Liberal Cabinet Ministers circulate his telephone number in the House of Commons. A little talk with Professor Jordan Peterson would be helpful in their stress related work. Liars, thieves, drunkards, murderers, drug addicts and sexual perverts know NOTHING AT ALL. One day, when all Christ rejecters stand before God the Son for judgment, they will be condemned for the greatest sin of all, rejecting Jesus Christ Who died vicariously for their sins and rose from the dead for their justification! Amen.